Since 2011, the conflict minerals debates has generated a substantial academic literature. Virtually all of it, except for work by the activists themselves, which is not peer-reviewed, find the program deeply problematic. More than a score of papers have argued that the campaign is a) irrelevant to the resolution of conflict in the region and b) damaging to the local people. I've posted many of these reports as they've come in, but I thought it might be useful to assemble them in one place. Here, then, are excerpts from some of those reports. Are victims of human rights abuses better off with or without economic sanctions targeted at their perpetrators? We study this question in the context of a US human rights policy, Section 1502 of the 2010 Dodd–Frank Act. By discouraging companies from sourcing ‘conflict minerals’ from the eastern Democratic Republic of the Congo, the policy has acted as a de facto boycott on mineral purchases that may finance warlords and armed militias. We estimate the policy’s impact on mortality outcomes of children born prior to 2013 and find that it increased the probability of infant deaths in villages near the regulated ‘conflict mineral’ deposits by at least 143 per cent. We find suggestive evidence that the legislation-induced boycott did so by stunting mother consumption of infant health care goods and services. The findings demonstrate how sanctions and certification programmes for human rights can unintentionally harm the vulnerable populations they seek to protect. Although its provisions have yet to be implemented, section 1502 of the Dodd-Frank Wall Street Reform and Consumer Protection Act is already having a profound effect on the Congolese mining sector. Nicknamed “Obama’s Law” by the Congolese, section 1502 has created a de facto ban on Congolese mineral exports, put anywhere from tens of thousands up to 2 million Congolese miners out of work in the eastern Congo, and, despite ending most of the trade in Congolese conflict minerals, done little to improve the security situation or the daily lives of most Congolese. In this report, I trace the development of section 1502 with respect to the pursuit of a conflict minerals-based strategy by U.S. advocates, examine the effects of the legislation, and recommend new courses of action to move forward in a way that both promotes accountability and transparency and allows Congolese artisanal miners to earn a living. While I am an advocate of disclosure and of the use of disclosure requirements to increase corporate social responsibility, the conflict minerals provision of Dodd-Frank poses serious risks to the integrity of such efforts. The provision and the rules drafted to promulgate it go far beyond disclosure and may impede issuers’ ability to conduct business in the DRC region. The Securities Exchange Commission (“SEC”), which pursuant to Dodd-Frank is charged with promulgating rules to implement § 1502 (the conflict minerals provision), lacks knowledge of the issues surrounding conflict minerals, a fact its Chairman freely admits. The rules that the SEC has currently proposed are overly draconian, and strict enforcement of them will put the SEC into the position of dictating not only rules of corporate governance but of indirectly dictating daily corporate operation themselves, as the proposed provision will likely drive companies to stop dealing entirely in minerals from the DRC region. Although the conflict minerals provision is framed as a disclosure requirement and thus seemingly falls within the purview of the SEC, the provision in fact is a back-end run around which indirectly imposes a trade embargo on the DRC and an attempt to require action, through SEC regulation, that Congress has previously refused to authorize. As such, the conflict minerals provision as proposed exceeds the mandate of the SEC and the intent behind disclosure requirements of the securities laws. If the aim is to block the trade of conflict minerals, there are more appropriate mechanisms to do so. If the provision is revised sufficiently, it may be a useful disclosure tool and could serve as the model for future requirements aimed at improving corporate social responsibility. Three narratives have dominated the discourse on the Congo and oriented the intervention strategies. These narratives focus on a primary cause of violence, the illegal exploitation of natural resources; a major consequence, sexual abuse against women and girls; and a central solution, reconstructing state authority. … The use of these three narratives has enabled advocates to put the Congo on the agenda of some of the most powerful states and organizations, and thus prompted action to end what remains a “forgotten conflict.” However, I argue that the well-meaning international efforts have also had unintended ramifications that have prevented the intervention from achieving its stated goals, and that have even, at times, contributed to the deterioration of the situation in eastern Congo. … Because of these exclusive focuses, the international efforts have exacerbated the problems that they aimed to combat. Wasn’t Section 1502 of Dodd-Frank supposed to “cut off funding to people who kill people”? Is the law working? As mentioned earlier, an underlying assumption of Section 1502 of the Dodd-Frank Act is that there is a close causal relationship between conflict minerals and violent conflict in northeastern DRC. According to Congressman Barney Frank, the express goal of Article 1502 was to use mining to achieve the “cut[ting] off of funding to people who kill people.” Though well-intentioned, such sentiments fail to address the root causes of conflict and grossly underestimate the resilience and adaptability of the warring factions. In recent months the armed groups have proven that they can quickly adapt, shifting from conflict mining to smuggling, racketeering (including ‘taxes’ imposed on coal and cattle) and bank robbery. Although strategies to stem the flow of funds to the warring groups are clearly critical in resolving this ongoing crisis, they can only be effective if they are part of a comprehensive solution that seeks to address the underlying drivers of the conflict; particularly security sector reform, socioeconomic inequality and poor governance. A major unintended consequence of Section 1502 has been to reduce the income of those generating a livelihood from the mineral trade (artisanal miners, transporters and traders), along with those working in other economic sectors that rely on the cashflow generated by the mining sector. The mining sector is a crucial part of the economy of North and South Kivu provinces, both in terms of provincial taxes and populations’ livelihoods. However meagre the income is, most people making a living in this sector do not have alternative sources of income or livelihood. This is in a context where insecurity continues to prevent the development of the agricultural sector which in the past – at least in North Kivu – was a more significant economic sector than the mining sector. Rather than addressing the funding of armed groups, the unintended result of the Act could be to reinforce smuggling networks and illegal economic activity, which undermines the implementation of traceability and certification initiatives. As some experts have noted, the oversimplification of the causes of armed conflict or of endemic violence in post-conflict environments such as the DRC has often led to the introduction of inappropriate and, occasionally bad, law. Section 1502 of the Dodd-Frank Act has not only come under attack by its critics for simply being bad law, but even its supporters have raised a number of concerns with the terms of the provision; whether the standards demanded are even achievable, because not practicable; whether the demands set forth in the provision are such that the risk of reputational damage as a consequence of inadvertently violating the statutory requirement are too high; and whether the cost of the disclosure requirements are so prohibitive that businesses simply can no longer afford to source from the DRC. The SEC has estimated that the initial cost of compliance will be approximately US$3–$4 billion, while the annual cost of ongoing compliance is likely to be between $207 and $609 million. But setting aside both costand risk to US businesses, are these drawbacks outweighed by the potential benefits that the legislation seeks to deliver? The initial signs are not reassuring since even before coming into operation, the Dodd-Frank Act has produced a number of unintended consequences of an adverse nature for mining communities in the eastern provinces. This was demonstrated by the events following the announcement by the EICC that, as from 1 April 2011, its membership would no longer permit purchases from refiners and smelters of tin, tantalum and tungsten that accepted material which did not comply with the regulatory requirement under section 1502. The announcement prompted an initial rush among traders to unload their stock with little concern as to whether any due diligence standards should be applied. Once the deadline had passed, traders in the Kivus and Maniema were unable to sell their remaining stock to those smelters and refineries that were seeking conflict-free smelter status under the CFS initiative. This left many traders with little choice but to sell to refiners and smelters not seeking CFS status, but at discounted prices. As revenue flows decreased, businesses were forced to close, unemployment rose, and poverty levels worsened. There has been a lack of socio-economic impact assessment and risk management planning on the legislation’s effects within DRC and GLR. The de facto embargo has devastated markets for artisanally mined tin, tantalum and tungsten, removing ASM as a viable livelihood option for tens of thousands of miners and their families, forcing them to relocate in search of work opportunities, move into gold mining and also other, less preferable livelihoods to them as individuals but also to society, e.g., bushmeat hunting and charcoal making which pose serious threats to local and international ecological resilience. There is widespread belief that civil conflict in poorly governed countries is triggered by surging international demand for their natural resources. We study the consequences of US legislation grounded in this belief, the “conflict minerals” section of the 2010 Dodd-Frank Act. Targeting the eastern Democratic Republic of the Congo, it cuts funding to warlords by discouraging manufacturers from sourcing tin, tungsten, and tantalum from the region. Building from Mancur Olson’s stationary bandit metaphor, we describe some channels through which the legislation could backfire, inciting violence. Using georeferenced data, we find the legislation increased looting of civilians and shifted militia battles toward unregulated gold-mining territories. These findings are a cautionary tale about the possible unintended consequences of imposing boycotts, trade embargoes, and resource certification schemes on war-torn regions. The year 2011 heralded the convergence of various initiatives seeking to curtail the financing of conflict in the Great Lakes region through the illegal exploitation of minerals. The combined effect of seeking to comply with the various processes has had significant implications at the national, regional and international levels by altering the dynamics of mineral exploitation in the region in both positive and negative ways. The positive impact has been in the area of the immense contribution of the initiatives to increased awareness of the role of illegally exploited minerals in financing conflict in the region and the need for various stakeholders to exercise responsibility in the sourcing and trading of minerals so as not to inadvertently fuel insecurity. On the flip side, however, this increased awareness has led to the labelling of minerals from the region, particularly gold, tin, tantalum and tungsten, as potential conflict minerals. While this has been important in boosting efforts at minimising conflict financing through the exploitation of minerals, the ‘conflict mineral’ label associated with the region has led to interrupted demand for minerals from the Great Lakes, the closure of some businesses dealing with the purchase and export of minerals, the loss of employment and a reduction in income within the local economy, and ultimately threatens to negatively reinforce the crisis created by the various conflicts in the region if nothing is done to stem the trend of unintended consequences. The capture of Goma by M23 rebel forces is the latest demonstration of the ineffectiveness of the government of the Democratic Republic of Congo (DRC) and its army (the FARDC). Whatever the political machinations behind the military's most recent capitulation may be, the overarching themes are the longstanding institutional and governance weaknesses of Congo's central authorities - weaknesses that the Southern Africa Resource Watch (SARW) has highlighted multiple times in its reports and analyses. And yet almost nothing has been done to actively tackle the real governance issues. In particular, the international community and the government of President Kabila have consistently neglected serious security sector reform in eastern Congo, partly due to the prevailing 'conflict minerals' narrative. But the reality on the ground could not be more different from the concept that every conflict in eastern Congo is - at its heart - a fight for control over the country's vast natural resources. This certainly does not appear to be the case with the current conflict. The current conflict is not about minerals. It is about Congo's dreadful governance - and the bloody role of neighbouring governments. 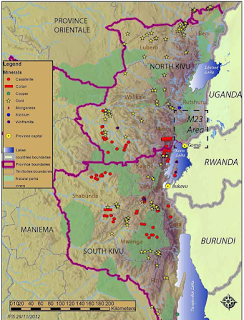 The map above [to right here, click for larger version] shows the most important mining sites accessible from Goma by road. It is striking that M23 currently does not control any of these areas. Moreover, none of the operations it has launched in the past months have targeted mining sites. This does not necessarily mean that M23 fails to derive a profit from the mineral trade. The bulk of North Kivu coltan and cassiterite are traditionally exported through the Goma/Gisenyi border crossing, creating opportunities for taxation. Additionally, after M23 captured Goma, it gained access to stocks of coltan and cassiterite that were waiting for export. Local sources have reported that M23 ‘liberated’ a cargo of 1.3 tonnes of minerals that had been confiscated by DRC authorities on the 3rd November. They explained that the M23 commanders Innocent Zimurinda and Baudouin Ngaruye have been facilitating the fraudulent export of large quantities of minerals from mines at Ngungu into Rwanda.26 There are also indications that M23 has traders working for them at the mining sites shown on the map. However, it is important to note that before their defection from the FARDC, M23 commanders were often deployed in mineral rich areas. In 2011, the UN Group of Experts documented that ex-CNDP commanders made considerable money from the mineral trade, describing ‘investments’ of, amongst others, Bosco Ntaganda, Innocent Kaina and Yusuf Mboneza.27 When these commanders joined M23 they subsequently lost control over such mining areas. Therefore M23’s leadership currently gains less from the mineral trade than it did while within the FARDC. From the above it is clear that establishing full military control over mining areas to maximise profits is not M23’s priority for now. As a consequence it has to rely on other means to sustain its war effort. In sum, since 2010, the legal market for tin, tantalum, tungsten, and gold from the DRC has shriveled, and the eastern provinces hardest-hit by conflict have been disproportionately harmed. Miners and their families are more susceptible than ever to the predations of armed groups. There is little market for minerals whose origins cannot be verified, and companies have voiced wariness about the investments and effort required to make verification processes work. The conflict rages on, and armed groups have taken advantage of opportunities to smuggle or launder minerals at the expense of independent mines and exporters. And infighting among armed groups, offensives by the Congolese army, and deals to consolidate armed groups into the Congolese army have produced bewildering changes in control over individual mining sites and surrounding trade routes. This Article ultimately concludes that conflict minerals rule is a poor choice for human rights legislation for corporations because the law’s flaws will lead to unintended and devastating consequences for the very beneficiaries it intends to help--the Congolese people. Thus, a pattern is emerging in which Kivu's mining sector is being asphyxiated in the name of reform. Before 2010, Kivu's mineral traders had willingly participated in moves to strengthen formal and legal channels and to safeguard Kivu livelihoods by creating “conflict-free” production and trading chains within Eastern Congo. The mining ban killed this off, and today the focus has moved to Katanga and Maniema, increasingly apparently favouring a nexus of mining firms closely linked to the power-holders in Kinshasa. Because they do not finance armed groups, these firms are seen as “conflict‐free,” but no criteria exists to judge the wider political ramifications of their activities, their benefits for local development and the possible exacerbation of local conflict caused by favouring certain firms in collusion with international partners to the detriment of others. (2000) stationary bandit metaphor, and suggests that the higher present value of mining sites prior to Dodd Frank caused armed groups to ‘protect’ miners and encourage steady long-run production. By lowering the value of certain mines, the policies caused the armed groups to behave like the more dangerous roving bandit, who has less stake in the future economic productivity of a mining area. We test the implication by merging georeferenced datasets on armed conflict, militarized mining sites, and mineral prices. We find evidence that the policies increased the incidence of conflict in mining territories shortly after their enactment by about 57 percent. In the last decade, a plethora of organizations and lobby groups (like for example the Enough Project) have sprung up to presumably curb this fatal association between war and natural resources in Africa’s Great Lakes region. One driving process, for example, has been the Dodd/Frank Act in the United States (for a brief summary see this document). The main problem with such reform programmes is that they misread the high degree of institutional pluralism that typically characterizes the regulation of mineral trade and exploitation in post-war environments. International agencies do not usually jump into an institutional void when proposing their reforms of privatization and enhancement of formal property rights, but these rights are typically formulated in competition with other systems of regulation, including ‘traditional’, ‘informal’ and ‘military’ rules of the game. How and in what specific institutional constellations such alternative systems of ‘power, profit and protection’ are being currently formulated and encapsulated will be the focus of a future study I embark upon with the support of the Swiss National Science Foundation. The question that is out there now for policy makers is whether it is better to do bad advocacy or no advocacy at all, as Laura Saey posted a few times (see also the hashtag #badvocacy on twitter). In the DRC, policy studies have systematically overstated the share of Congo’s resources in the global economy and the conflict, they also wrongfully depict the ASM sector as being generally unregulated, criminalized and dominated by military agents. This dangerous uncritical equation of resource exploitation with criminality and state fragility in a context of war-to-peace transition not only blatantly ignores the motivations of hundreds of thousands artisan mine workers, their group interests and economic risk dispersal behaviour, but it actually risks generating exactly the opposite effects of peaceful development, namely more violence and military exploitation, Sara Geenen and Dan Fahey suggest. need to address a number of negative traits of the mining industry, including the high level of militarization, corruption and exploitation of women and children, and has sped up the mining reform process, little real progress has been made on the ground. Living conditions of miners have not improved, the sector is still highly militarized, and a multitude of exploitative networks still control large parts of it. As we noted in our 2010 report, U.S. agency and UN officials and others believe that the minerals trade in the DRC cannot be effectively monitored, regulated, or controlled as long as armed groups and some members of the Congolese national military continue to commit human rights violations and exploit the local population at will.